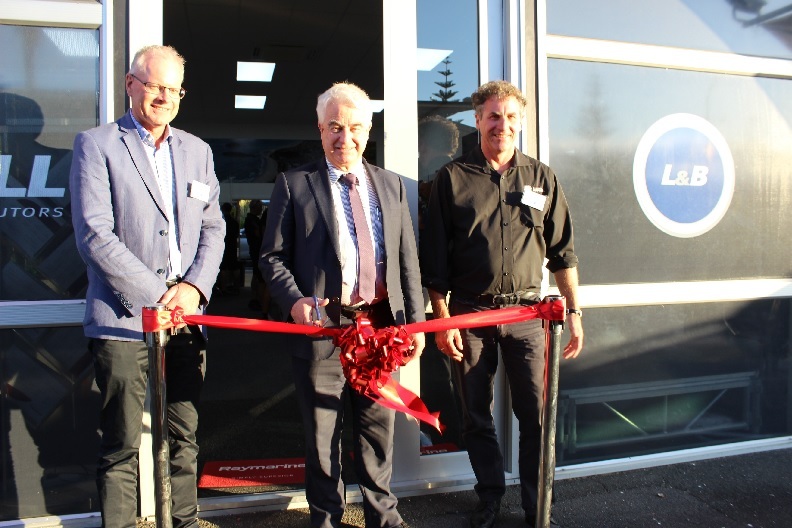 Officially opening Lusty & Blundell’s new Tauranga showroom and service centre are (from left) NZ Marine executive director Peter Busfield, Tauranga Mayor Greg Brownless and Lusty & Blundell CEO Mark Milburn. The official opening, which was also a NZ Marine Boating After 5, gave keen boatie Mayor Brownless, industry members and media the chance to check out the new showroom and service centre. It also gave them the chance to meet branch manager Morgan Brodie; staff Grant McMillen, Paul Jury, Kahlo Bubb and Sam Wilkinson; Lusty & Blundell brand ambassadors Scott and Mig (from Fishing and Adventure) and Nicky Sinden (from TradeZone Addicted to Fishing); along with representatives of L&B’s valued partner organisations.